(EDIT, problem wasn't the track it was something else). I've Been driving this one a lot lately since I got an older F1 mod (back when I enjoyed F1). Only fault I had was the cameras. So I just made new ones. Should be the one from the GP4 game which was the old layout, the videos is usually the most correct ones. Hmm... I am a bit confused with the Hockenheim mods tbh... I have a Hockenheim mod with the modern layout called "Hockenheim Grand Prix". This one looks quite good and it has a lot of grip. 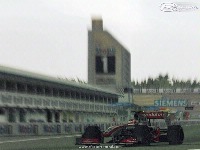 I also have a mod called "Hockenheim GP". This one just looks awful... So I don´t use it. The profile shows the "old" version - but if you click on the video, a F3 fight is shown on the "new" layout. Also if I take a look at the times the linked setups should provide - this cannot be the "old" layout..
What is Hockenheim GP4?? Old or new layout - or both? when could wee have a modern layout ? please. Hi, I have problems in this track.